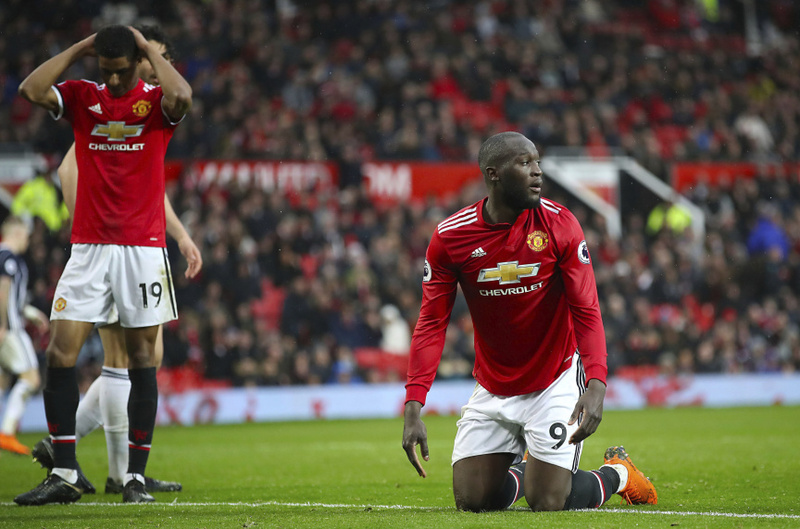 MANCHESTER, England (AP) — Manchester United gifted the Premier League title to fierce rival Manchester City in improbable fashion by losing 1-0 to last-place West Bromwich Albion on Sunday. A week after preventing its neighbors from clinching the title in front of their own fans by rallying from 2-0 down to win 3-2, United delivered a similarly unlikely result as managerless West Brom pulled off one of the shocks of the season. Jay Rodriguez headed in a 73rd-minute winning goal to seal only a second win since August and allow City to clinch the title without kicking a ball. City manager Pep Guardiola might have rubbed his eyes in disbelief at events at Old Trafford when he returned from his round of golf with his son. His decision to forego the match looked justified considering West Brom's dreadful form, but the visitors easily coped with United's ponderous attacks and looked dangerous going forward. West Brom is still nine points from safety and looks destined for relegation. United is now just one point above third-place Liverpool. United should have had a first-half penalty after Craig Dawson caught Ander Herrera, but complacency seeped in and West Brom showed fight under caretaker boss Darren Moore that has been sorely lacking this season. United was too narrow and predictable, with wide players Alexis Sanchez and Juan Mata constantly cutting inside and leaving the midfield congested. By the hour mark, Mourinho had brought on attacking players Jesse Lingard and Anthony Martial for central midfielders Ander Herrera and Paul Pogba but things didn't really improve. It wasn't the best day for Romelu Lukaku against his former club, either. When his first touch wasn't heavy, he found Ben Foster an impenetrable barrier as the West Brom goalkeeper produced impressive saves from Lukaku in each half. Ultimately, Rodriguez was the savior for West Brom — and the title-clincher for City. Just days after the Football Association announced that a charge of racially abusing Brighton's Gaetan Bong had been found "not proven," the forward pounced to score from close range after United midfielder Nemanja Matic headed the ball back into his own area at a corner. "Manchester City, we won it for you," chanted the West Brom fans at the end of a match greeted by jeers by United supporters. Mourinho said his players were "masters in complicated football." "We couldn't play fast, we couldn't think fast, everything was complicated," he said. "One more touch to control the ball, one more flick, one more trick. We always gave them the opportunity to be solid, compact in the low block with strong physical players. "They always had time to organise themselves. We wanted to dribble and dribble, and everything was complicated."